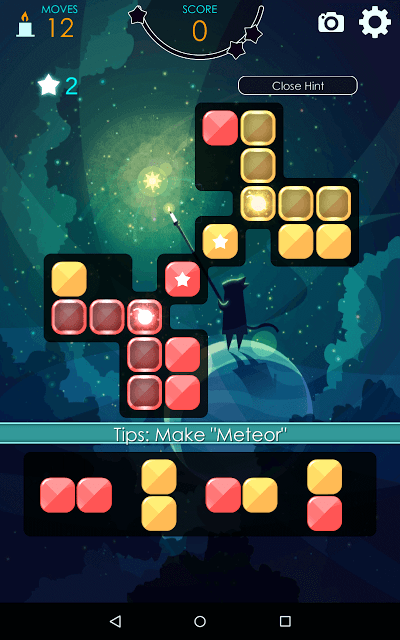 Mr. Catt is a stunning tile-matching puzzler from Zplay. It takes you to a magical world of cats. The black cat is looking for his friend and only you can help him find his best buddy. You will have to move from one star to the other solving intricate puzzles, which are far from the usual stuff that you find in most match-3 puzzle games. The visuals are beautiful and you will fall in love with those enchanting Easter eggs that appear on the level map. Tap a box and out pops a cute kitty. Tap the floating apple in space and it will jump a notch higher. Mr. Catt has several such animated Easter eggs hidden on the galaxy map. Each star contains a unique puzzle board, which has colorful blocks scattered here are there. You can drag blocks on to the puzzle board to match 3 or more blocks of the same color and collect starred blocks to complete objectives. Special or “Mighty” blocks such as Lightening and Rainbow will help you clear as many blocks as possible. You will have to strategically place blocks, create special tiles, and try to clear several blocks in one move to win a level before running out of moves. This beginner-level guide provides tips and strategies that will help you make better use of special blocks and runes. Mighty blocks are power-ups that will help you clear as many blocks as possible. 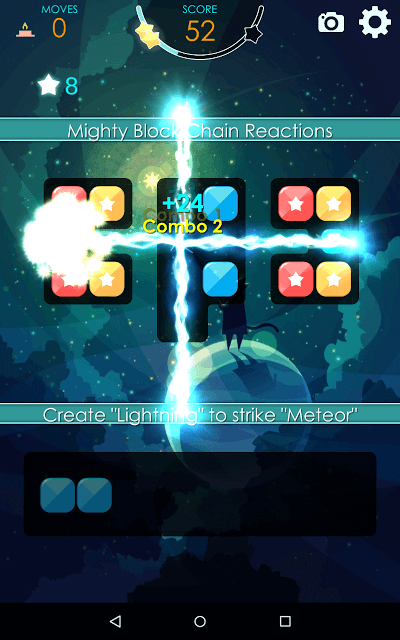 There are 3 main types of mighty blocks: Meteor, Lightening and Rainbow. To create Meteor, you will have to link 5 blocks of the same color. Drag and drop the blocks onto the game board in such a way that all 5 blocks of the same color are placed next to each other. You don’t have to arrange them in a specific shape to create a meteor. It can be an L-shaped match, a T-shaped match, a horizontal or vertical match. Just make sure that all 5 linked blocks belong to the same color. After creating a Meteor, check its background color. Now drag at least two blocks of the same color and link it to the meteor block. Tap the 3 linked blocks to detonate meteor. So if the Meteor block is red, then you will have to connect it with two more red blocks and then tap to activate it. Lightening: To create Lightening, you will have to link 7 blocks of the same color. Again you can arrange the blocks in any shape as long as blocks are of the same color, but make sure you plan ahead before dragging and dropping blocks onto the game board. Once the blocks are dropped on the game board, you cannot move them. Rainbow: This mighty block is probably the most helpful and can clear different colored blocks. To create a Rainbow block, you will have to link 9 blocks of the same color, in any shape. Keep in mind that all 9 blocks of the same color should be linked to each other to create a rainbow block. 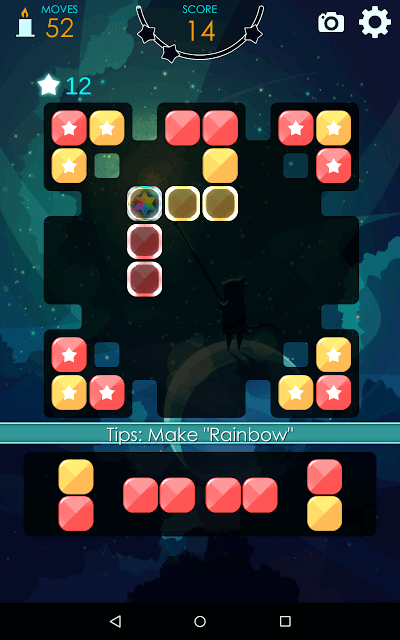 Once a rainbow block is created, link at least two blocks of the same color with the rainbow block and tap the screen. All blocks of that color will be cleared from the game board. If you have linked two green blocks with a rainbow block, then all green blocks on the game board will be cleared. After creating a rainbow block, check the number of starred blocks on the game board. Also note down the color they belong to. Rainbow blocks are not easy to create as the tiles on the rack at the bottom of the screen appear randomly. Also, linking blocks belonging to different colors may not be easy owing to the randomness of the blocks on the rack. Refreshes the blocks on the rack. Use Shuffle if you find that the blocks on the rack can’t be linked or matched with the blocks on the game board. Can be used to destroy a block. Use it to destroy a block that comes in the way of linked blocks. So if a yellow block is placed on an area that is full of red blocks, just use Strike to remove it. Once removed, you can now drag and drop red blocks to link the ones already on the board to create power-ups or to clear them. Appears before the game begins. You can use up to 2 free Mystery star. Each star will provide 3 special powers out of which you can choose only one. You should select a power up that you think will help you win a level. Go for mystery star in case you can’t complete level after trying several times. So you have cleared almost all blocks, except those three green starred blocks, and are now out of moves? Instead of replaying a level, you can start from where you left. Unlike other games, Mr. Catt gives you five more moves after watching a short 30-sec video. Look for the “Watch Video” link at the bottom of the screen. You don’t have to be in a hurry while matching blocks. The game isn’t time-based and so you can patiently examine the game board and the blocks arranged on it. Each level has a unique board layout and you will have to create mighty blocks according to your current level’s board layout. For example: If the game board is divided into three smaller boards, then you may have to create lightening block on the middle board to clear blocks placed on boards placed on the left and right side of the game board.